Obstructive sleep apnea (OSA) is one of the most common respiratory conditions in children and it’s estimated that one to five percent of children have it. OSA is more common in overweight/obese children. OSA is characterized by partial or complete obstruction of the upper airway (respiratory tract). The most common single cause of OSA in young children is enlarged adenoids, tonsils, or both. Studies have shown that OSA occurs most commonly between the ages of two and eight, and peaks in pre-school-aged children, a period of development when a child’s adenoids and tonsils are large relative to the size of their airway. Children who have OSA can have any of the following symptoms while they sleep: snoring, trouble breathing or increased work of breathing, mouth breathing, neck hyperextension (in an attempt to open their airway), waking up frequently, and restless sleep. Parents may also notice signs of OSA in their children during the day. These include excessive daytime sleepiness, increased napping, and morning headaches. Other daytime symptoms can include decreased attention, hyperactivity, aggressive behaviour, and learning difficulties. Sleep disorders have been reported in an estimated 25 to 50 percent of children with attention-deficit hyperactivity disorder (ADHD). Some studies have suggested that the link between OSA and ADHD is related to frequent awakenings and disruption of sleep. Primary care doctors (family doctors and pediatricians) who suspect that a child has OSA can refer the child for specialized sleep testing to help make the diagnosis. Polysomnography (PSG) is considered the best method or the accepted ‘gold standard’ test for OSA in adults and children. PSG involves overnight evaluation of measures such as oxygen saturation, heart rate, and breathing signals, as well as monitoring of the child’s brain activity to measure sleep stages. PSG is used to establish the frequency of obstructive and/or central pauses in the child’s breathing. A simpler diagnostic test done in the home, called nocturnal home oximetry, is often used as a first pass test. This test provides important information about a child’s oxygen levels and pulse rate during sleep. Tonsillectomy/adenoidectomy (T±A), which is the surgical removal of tonsils and adenoids, is the first-line treatment for children with OSA. Several studies have shown that T±A improves sleep, breathing, and quality of life in children with OSA. Another treatment option for some children is non-invasive ventilation (continuous positive airway pressure (CPAP), or bi-level positive airway pressure (BPAP)). Weight management is another strategy for improving OSA symptoms in children who are overweight or obese. Talking to your child’s doctor is the first step if you think your child has symptoms of OSA. Your doctor can then refer you to specialists at the Montreal Children’s Hospital, including sleep medicine clinicians at the Sleep Laboratory, respirologists and/or otolaryngologists for evaluation, diagnostic testing and treatment. Ref. 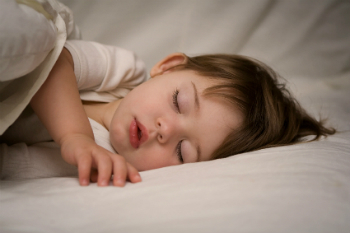 : Constantin E. and Horwood L. (2013) Pediatric Obstructive Sleep Apnea. In: Kushida C. (ed.) The Encyclopedia of Sleep, vol. 3, pp. 290-295. Waltham, MA: Academic Press.